Clay blank on wood for AIA medallion. Awarded as the AIA Craftmanship Medallion from 1960-1976. 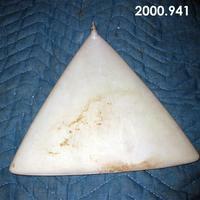 Plaster blank oval shaped. Lot of stains and dirt. 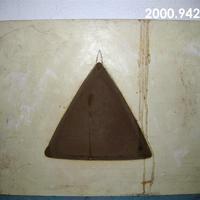 Plaster mould, reinforced with iron rod, galvanized pipe and burlap with inner surface shellacked. 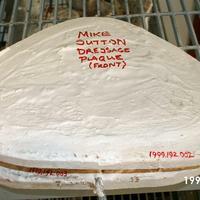 "Mike Sutton Dressage Plaque" written on it. Plaster mould reinforced with metal rods and burlap, shellacked inner surface. 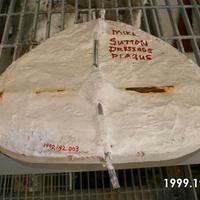 "Mike Sutton Dressage Plaque (Front)" written on mold. 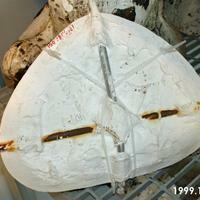 Plaster mould, inner surface shellacked, outer reinforced with rusted iron rod and galvanized tube. 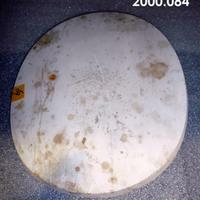 This section of the 3 parts of the mold has a plaster positive inside. Mold is bound with plastic zip ties. 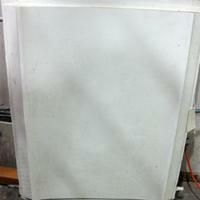 Rectangular plaster blank for portrait relief. 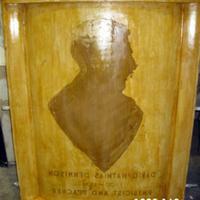 Plaster portrait relief blank of Jerome Patrick Cavanagh Mayor of Detroit. The outline and pencil sketch of the portrait is still visible while the rest of the plaster blank is stained from the shellac used to seal the plaster. Text on blank is "Jerome Patrick Cananagh Mayor of Detroit 1962-1970". Blank with clay stain portrait of David Mathias Dennison. The yellowish discoloring is from shellac used to seal the plaster. 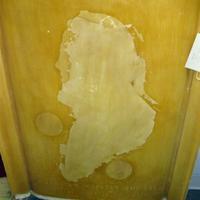 Plaster portrait relief blank of Jerome Patrick Cavanagh Mayor of Detroit. The outline of the portrait is still visible while the rest of the plaster blank is discolored from shellac used to seal the plaster. 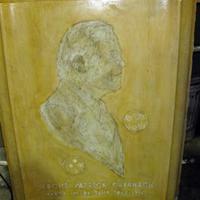 Text on relief is "Jerome Patrick Cananagh Mayor of Detroit 1962-1970".